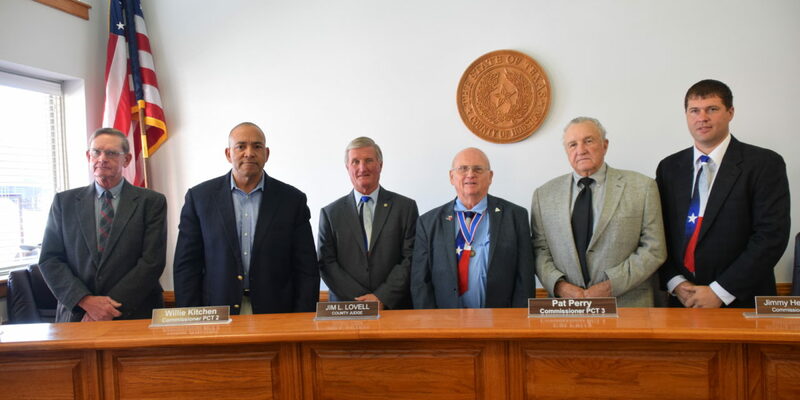 HOUSTON COUNTY – During the April 9 meeting of the Houston County Commissioners Court, Clayton Starr Clayton Starr, President of the Athens Chapter of the Sons of the Republic of Texas, addressed the court and read the first part of a document proclaiming April 21 as San Jacinto Day. “The Battle of San Jacinto commenced at 4:30 p.m. on the afternoon of April 21, 1836 in what is presently Harris County, Texas and was the decisive battle of the Texas War of Independence,” he said. “Led by General Sam Houston, marching into battle to the tune of ‘Will You Come with Me to the Bower’ and shouts of ‘Remember the Alamo’ and ‘Remember Goliad,’ the Texians engaged and defeated Mexican dictator General Antonio Lopez de Santa Anna’s forces in a battle that lasted only 18 minutes. This victory assured and resulted in an independent Republic which nine years later became the 26th state in the United States of America,” Starr said. The proclamation was unanimously adopted. Prior to the proclamation, Tony Oliva – the project manager involved with air conditioning repair at the Houston County Courthouse – reported the courthouse would need to be closed on Thursday afternoon beginning at 4 pm. “This Thursday (April11) at 4 pm we are going to shut the courthouse down. No one will be able to be inside. We are going to have a lift going on in the inside. We’re going to have a crane posted up to bring the last piece of equipment to the roof to get everything operational,” he said. Oliva said the courthouse would be open for business on Friday and the building should have air conditioning in approximately 12 days. The payment of bills and expenses incurred by the county was approved. The Houston County Treasurer’s, Environmental and Community Service reports were received as information by the court. The court approved salaries for new and transfer employees. The commissioner’s approved allowing the County Attorney’s Office to continue usage of Google Calendar. The Houston County Employee Handbook was updated to reflect changes in the amount of vacation hours which could be carried over. The May meeting date of the court was moved to Friday, May 10 at 10 am.